When you’re born, everyone will “Oooh” and “Aaah” over your every move. It’s kinda like that when you’re a baby … you’re incredibly cute and you smell good and people make a big deal over you because you are a big deal. And you’ll be loved. How do I know this? Because I know your momma. Trust me on this one. Things you should know before you make your grand debut. – your parents are teachers, which means people think they make a ton of money for little work. Nothing could be further from the truth. They teach because they believe in it. They see the good in all kids, and they make a difference. – you better like soccer. Since your parents coach soccer, I have a sneaky feeling that you’ll be out there on the field at an early age. Personally, I don’t get the sport. But you ought to. Might make for some uncomfortable Thanksgiving dinners. When you’re just five. Just like soccer, ok? – and please know what a comma splice is. Your momma knows what one is and can help you with them. You could ask your dad, too. But I’d ask your momma. She’s the English teacher. – when you get to school, don’t make any excuses. Granted, your parents teach in another district, but they’ll know people (we all do). No excuses. I have no idea what type of world you’ll live in. There are times that I want to turn off the news and cry since the news is so depressing. You can go days and days without any good news. But that thing about you being loved? I know that to be a fact. By your flesh and blood family. And by the family that comes together 184 days a year. So enjoy the ride, little one. I can’t wait to see how you take this world by storm. And if you need a second opinion on comma splices, come find me. But you’re on your own with the soccer business. I’m not even going to pretend to understand it. 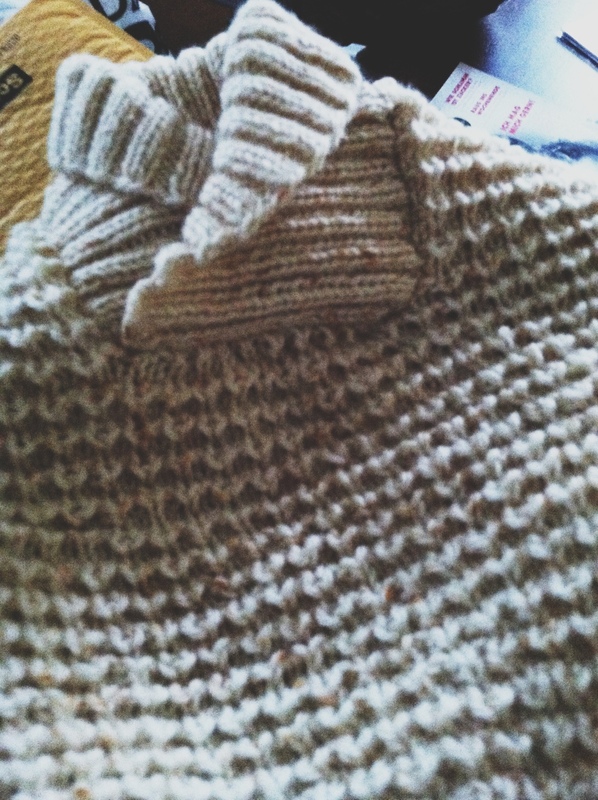 Yarn: Sirdar Snuggly 0265 … and, yes, machine washable because no new mom should have to worry about felting a sweater. Modifications: None. It was an easy and straight forward pattern. There were a few iffy directions (the sleeve seams), but overall, easy peasy. Oh, there was a modification. I couldn’t get the pattern increase on the sleeves to work, so I worked them plain. 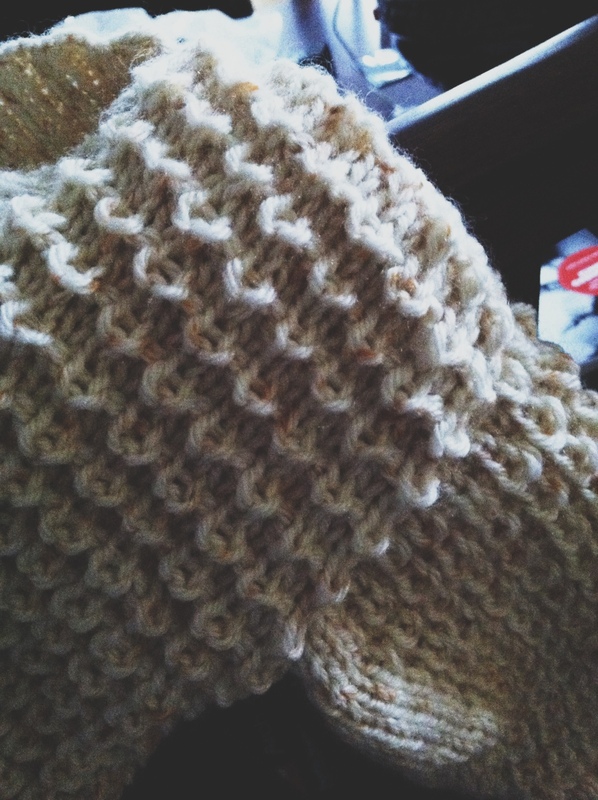 Favorite knit pattern ever. And you typed “momma”. Almost makes me want to knit again. Wonders never cease, right? Knit something easy like a triangle shawl. 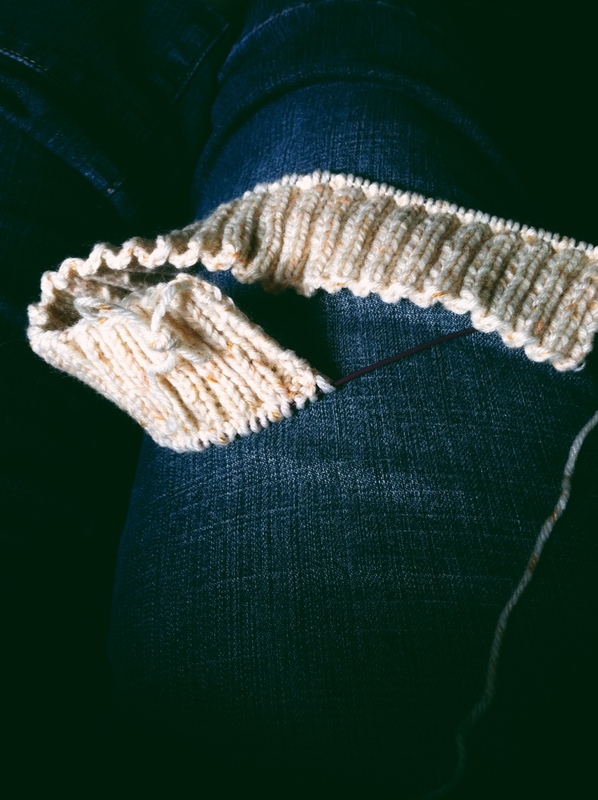 I’m knitting one for a class (worsted on 10s) … real fast!